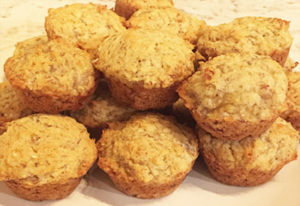 Are you looking for a banana muffin recipe without gluten? How about a recipe that doesn’t use eggs? Or are you sensitive to refined white sugar and need a recipe that is delicious that uses a sugar substitute? 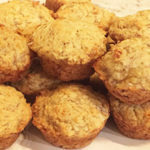 Moist and delicious gluten free banana muffins. This is absolutely the most delicious gluten-free, egg-free, dairy-free, refined-sugar free banana muffin recipe out there! I’ve tried many gluten free banana muffins and most end up dry and crumbly. I prefer to sink my teeth into a soft and moist muffin with great flavor and no crumbs to have to clean up! You can use any type of gluten free flour that you prefer. It may change the taste a bit, so I prefer to use an all-purpose gluten free flour such as Bob’s Red Mill. I also choose Erythritol as my preferred sugar substitute (Trim Healthy Mama brand) as it is GMO free, zero-calories and it doesn’t change the taste when compared to refined white sugar. 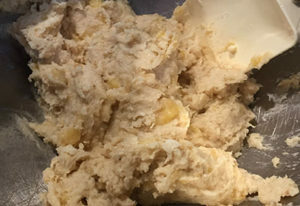 The dough will be dry until the bananas are added. You can make this recipe in your mini-muffin pan and will end up with approximately 18 muffins, or you can make it in a standard muffin pan or a small loaf pan. Just increase the baking time until a toothpick that is inserted in the center comes out clean. The best gluten free, dairy free, egg free, refined sugar free banana muffin recipe! Moist and delicious and so easy to make! In a large bowl, mix the room temperature butter, sugar and vanilla until smooth. Sift in the flour, baking soda and salt. The mixture will be extremely dry! Mash the bananas with a fork. Add the mashed bananas to the other ingredients and mix until well incorporated. Batter will be thick. Using a scoop, add batter to muffin tins. Fill each hole until ¾ full. Bake in preheated oven for approximately 20 minutes, or when a toothpick is placed in the center of the muffins and comes out clean.